As the halfway mark of the 2018-19 season approaches, let’s take a look at how each team has done thus far. Remember, grades are not based solely on a team’s record, but rather their expectations coming into the season and what the future outlook is. Thank you’re having trouble sleeping at night? How do you think it is for Hawks GM Travis Schlenk as he watches Luka Doncic’ put up incredible performances night-in, night-out. To his credit, Trae Young has been solid, averaging 15.6 points and 7.2 assists per game, though his turnover numbers are problematic and his slight frame puts him in a lot of mismatches defensively. Aside from that draft night blunder, Schlenk has actually done a reasonable job in assembling this squad. Second-year forward John Collins has emerged as a long-term stud to build around, Taurean Prince has been out with injury but has looked like he can be a competent starting small forward in the NBA and rookies Kevin Huerter and Omari Spellman have had some promising flashes this season. At 13-30, the Hawks priority should be to continue developing young players and set themselves up with another high lottery pick next season. As the deadline approaches, look for Atlanta to move guys like Kent Bazemore and Dewayne Dedmon in exchange for draft picks or expiring contracts. Following their remarkable run in the playoffs last season, everyone already had the Celtics penciled in to face the Warriors in the NBA Finals this season. I mean what could go wrong? You’re adding a bonafide superstar in Kyrie Irving and an all-star in Gordon Hayward to a team that came a game away from making the finals. Simply put, the team has not gelled. Irving’s ball-dominant style of play has taken away from motion offense that the Celtics had so much success with last season. The overall balance of the team has improved since Marcus Morris and Marcus Smart were inserted into the lineup, but the team is clearly far from a finished product. Luckily for the Celtics, this is only the middle of the semester and like a handful of other teams around the league, they know that they will ultimately be evaluated based on their playoff run. To enter the postseason in the right frame of mind, the Celtics will need to shore up their defense, improve on their mediocre (10-12) record on the road and find the right on-court chemistry. Sean Marks and Kenny Atkinson have quietly done a very admirable job during their short tenure in Brooklyn, especially considering what they inherited from the disaster left behind by the Billy King regime. I mean, don’t look now but the Nets are actually playing some decent basketball at 21-23, good enough for 7thin the East. De’Angelo Russell looks like a far better player now than he did for the Lakers, Spencer Dinwiddie has been a revelation, and guys like Jarrett Allen, Joe Harris and Rodions Kurucs have all been way better than expected, giving the Nets a solid core moving forward. It’s also worth noting that the Nets have done this without their leading scorer Caris LeVert, who went down with a serious injury, only 14 games into the season. It will be very intriguing to see whether the Nets decide to make a move at the deadline and improve their chances of a playoff run or wait for the off-season where they will have an opportunity to select two 1stround picks and potentially sign two max salary players. Whatever option they choose, the Nets are well positioned to be a quality team for a long time. Wondering what incompetent organizational leadership and management looks like? Look no further than the Charlotte Hornets. What is it going to take for this franchise to just hit the reset button and rebuild already? For the past handful of seasons they have been stuck in no mans land; not good enough to contend but not poor enough to select high-level lottery players, either. Kemba Walker has played at an All-Star level this season, but outside of Jeremy Lamb, the Hornets have not gotten consistent production from anyone else on their roster. Nicolas Batum continues to have arguably the worst contract in the NBA, as he has criminally underperformed for the past few seasons and guys like Michael Kidd-Gilchrist and Frank Kaminsky have taken steps backward. With so many teams around the NBA in desperate need of a quality point-guard, now is the time for the Hornets to move on from Walker and start from scratch. Give an opportunity to Malik Monk and Miles Bridges to see what they could do, and commit to a long-term rebuild to get this franchise back on track. From the abrupt firing of Fred Hoiberg, to reports of players refusing to practice, to the franchise pulling the plug on a very expensive Jabari Parker experiment, the Bulls are on the verge of receiving a failing grade, only hanging on by a thread. That thread takes the form of: Zach LaVine, who amongst the avalanche of drama in the team and organization, has had a breakout campaign and Lauri Markkanen, who has reminded all of us how good he is since returning from injury. Kris Dunn has also played better of late and rookies Wendell Carter Jr and Chandler Hutchinson have the rest of the year to continue to develop. It will be up to new head coach Jim Boylen, to hold these young players accountable for their actions and set the right foundation for next season. “We’re still four-time Eastern Conference champions, so until you take us down from that, teams ain’t got much to say,” said Tristan Thompson coming into the season. One has to admire Thompson’s confidence, though it is safe to say that the Cavaliers have been ‘taken down from that’, in fact all the way down to the worst record in the NBA at 9-35. Lets face it, life after LeBron James is a painful process and the season-long injury to Kevin Love has not helped the team transition. At least, the Cavaliers know where they stand and will continue to devote this season to developing young players like Collin Sexton and Cedi Osman. Look at the bright side; it can only get better from here. Besides, something tells me that Cavs fans are watching more Duke games than Cavs games these days…coughZIONcough. A 4-0 start to Dwane Casey’s first season with the Pistons skyrocketed the teams expectations early on. That strong start, however, was only a temporary illusion, masking the same issues that have crippled this team for the past few seasons: Blake Griffin and Andre Drummond struggling when on the court together, and the Pistons lacking reliable wing players and shooters. All in all, the roster is poorly constructed and the Pistons should look to be active in the upcoming deadline, especially considering the current state of the Eastern Conference and the fact that the bottom three spots are there for the taking. Pacers GM Kevin Pritchard was mocked after trading Paul George for what was perceived then to be a mere return of Victor Oladipo and Domantas Sabonis. Fast-forward a few seasons, and the move looks like a stroke of genius. 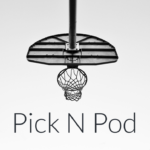 The Pacers have a franchise player (Oladipo), quality young players, (Myles Turner, Sabonis) and a host of capable role players (Bojan Bogdanovic, Thad Young, Tyreke Evans) that all fit perfectly together. They also have a coach-of-the-year in Nate McMillan, at the helm. Kudos to the Pacers for turning what everyone thought would be a four-team mix at the top of the Eastern Conference (Boston, Toronto, Philadelphia and Milwaukee) into a five-team one. They are 28-14, which is all the more impressive when taking into account Oladipo has sat out several games. Built for both the present and the future, the Pacers front office does not get enough credit for the work it’s done. Injuries and the Dwyane Wade farewell tour make the Heat a somewhat difficult team to grade. Starting point-guard Goran Dragic has only played 14 games, Dion Waiters only returned recently and the majority of the players in the Heat rotation have missed some time due to injury. All of that considered, the Heat have actually weathered the storm pretty well. Josh Richardson’s emergence as a fringe all-star and the team’s best two-way player, is a welcome sign as is the improvement of Justice Winslow and Bam Adebayo. As they continue to get healthier, look for the Heat to perhaps close to the gap on the top five teams and play more consistently. They will need to improve their play at the American Airlines Arena, however, as they are inexplicably the only team in the NBA with a better record on the road than at home. When comparing the 2017/18 Bucks roster to the 2018/19 version, there are not many differences. Aside from a few role players, not much has changed. How then have the Bucks taken such a major step forward? The answer is Bucks coach, Mike Budenholzer. From his impact on the culture of the organization, to the confidence he has instilled in the players, to schematic changes he has made on both ends of the floor, it is clear why he is considered one of the best coaches in the league. No one has benefited more from the coaching change than Giannis Antetokounmpo, who is having a career year and has emerged as one of the frontrunners for this season’s MVP award. To give Giannis the maximum amount of space on the court that he needs to operate, Budenholzer has surrounded him with basically a roster full of shooters. The Bucks are probably the deepest team in the NBA, with up to twelve players in and out of the rotation. Look for this team to continue improving and to be in the thick of the Eastern Conference title race. As was made clear in the preface, grades are not solely based on a team’s record but their expectations as well, and looking at the Knicks roster without Porzingis all season, there really were no expectations. With an eye on the future, (2019 high draft pick and free agency) it is safe to assume that this team will look dramatically different in the future. With that said, there have still been some bright spots and David Fizdale has managed to get the most out of what he’s had to work with. Tim Hardaway Jr. is a keeper and will be a starting shooting guard in the NBA for a long time. Kevin Knox, Alonzo Trier and Mitchell Robinson are all rookies that have shown plenty of promise and should figure into the Knicks plans moving forward. Even reclamation projects like Emmanuel Mudiay, Trey Burke and Noah Vonleh have to some extent been successful. Not all is bad, hopefully with some key additions in the summer, competitive basketball will soon be returning to the Mecca. With Steve Clifford at the helm, there have at least been some signs of improvement in Orlando this season. The team is 19-24 and only a game outside of the final playoff spot. Though, I am not sure making the playoffs is in this team’s best interests, as there is very little to get excited about with their current core. Nikola Vucevic has been a revelation this season, playing at an All-Star level. Oddly enough, this might also be the Magic’s biggest problem, because it has taken minutes and opportunities away from youngsters, Mo Bamba and Jonathan Isaac. Aaron Gordon was supposed to be the star piece to build around in Orlando, but his progression has stalled. With Vucevic’s (and perhaps, Terrence Ross’) trade value at an all-time high, the Magic should look to trade them and accumulate assets for the future. The team is still a few pieces away from being competitive and sustainable. A soap opera could be created out of the 76ers season thus far. From the Markelle Fultz ordeal to the extracurricular drama Jimmy Butler brought on board, to Joel Embiid’s discontent, it’s been a real juggling act for coach Brett Brown. They are as talented as they are complicated, both on and off the court. With that said, at 28-16, the 76ers have still gotten off to a solid start. On paper, they are right there but on the court there are a few areas that need to be ironed out before the playoffs start. First, the 76ers big three needs to learn how to co-exist and play effectively together. Second, depth needs to be addressed. If youngsters Landry Shamet and Jonah Bolden cannot give them consistent minutes, then look for the 76ers to add pieces at either the deadline or via the buyout market, like they did last season with Ersan Ilyasova and Marco Belinelli. 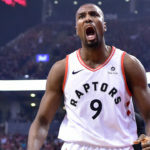 Critics will argue that this is just the same old Raptors; great in the regular season but will fold up like a lawn chair when the playoffs come around. The scepticism is warranted, but this team just looks different. 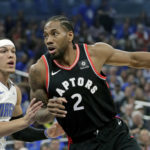 No one really knew what the Raptors were getting in coach Nick Nurse (no previous head coaching experience) or Kawhi Leonard (only played nine games last season and questions of motivation). That both have transitioned into their roles so seamlessly and quickly this season, is nothing short of spectacular. Yet, there is more to the story than Nurse and Leonard. 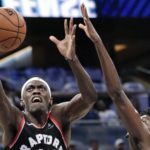 Serge Ibaka is playing the best basketball of his career; while healthy, Jonas Valanciunas was one of the most efficient scorers in the league off of the bench; Fred VanVleet continues to excel in his 6thman role; and Pascal Siakam has arguably been the most improved player in the NBA. This team looks like it finally has all of the right pieces to come out of the Eastern Conference this season. After signing Dwight Howard and Austin Rivers in free agency this past summer, the Wizards felt as though they would be able to compete with the elite teams in the East. For various reasons, it has been a complete and utter failure. 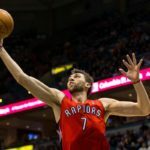 Now, marred by horrible long-term contracts to players who have severely underperformed, (John Wall, Otto Porter) it is difficult to see a way out of this mess. Since Wall’s season ending injury, Bradley Beal has taken over as the leader and primary scoring option and the team has actually played better. Acquiring Trevor Ariza was an important veteran upgrade for a disjointed Washington locker room. If indeed, “everyone eats,” when Wall is sidelined, there should be plenty to go around for everyone in the coming months. With all of their struggles, the Wizards can still salvage their season, as they are only two games of the No. 8 seed.